Thank you all for your very sweet birthday wishes! It was a real treat to read all your kind comments. Would you like to hear what I did on my birthday? I did some antiquing and some bead hunting. I have loved rocks and minerals since I was a little girl, and have always collected them. When I began creating jewelry many years ago, I only used precious metals and natural stones. Eventually I began to enjoy crystals, and pearls, as well as many vintage beads. Above from top to bottom, labradorite faceted rondells, African reclaimed metal beads, tiny vintage rhinestone string, and pyrite (4mm rounds, to give you an idea of their size). There are several lovely bead shops in Asheville and I had a great time in two of them. 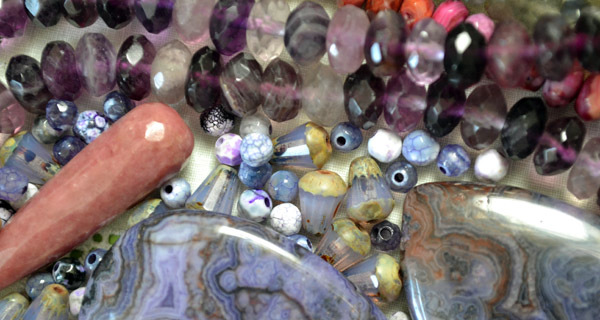 Here are some faceted amethyst, a rhodonite drop (the pink one), some crazy lace large stones and some lovely little beads. I wonder how many of you are rock lovers? Do any of you make your own jewelry? I also found some lovely things in local antique shops. as well as admire her stamina! I hope I can be doing the same at 92! And... vintage fresh water pearls and old buttons as well as some old Ledger Monthly magazines. 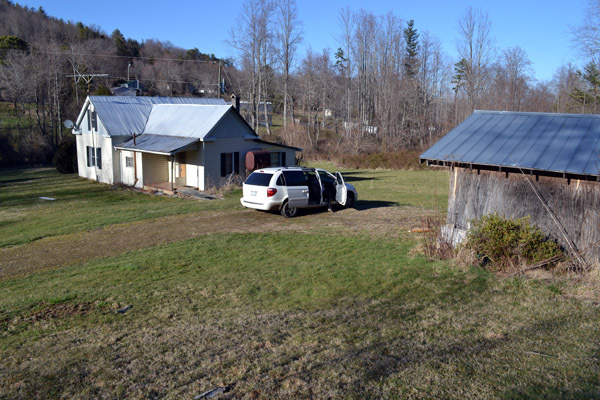 My hubby and I went out with a real estate agent to look at property in the mountains! This was one of the farms we looked at. It has about 30 acres and an old 1917 farm on it. And when I say that this house was not restorable, believe me! Oh my! The insides were beyond true description! lol! There are also several out buildings. We learned some things during out first outing. Any advice from you out there who have bought property before? I was totally in my element out in the mountains! In the evening we had a lovely romantic dinner at a tapas restaurant where the food was incredible! He was a real sweetie! Here I am...a tired and happy. a gorgeous personal tissue holder she made! The material has a very lovely shimmer to it. The holder was beautifully sewn into a wax bag. Lovely presentation! Thank you so much Sherry! I appreciate your heartfelt wishes! 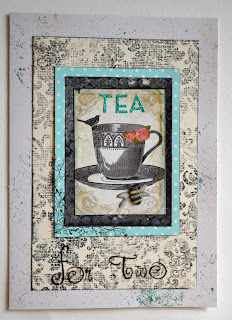 Jan, at A Journey, sent me this lovely handmade card! 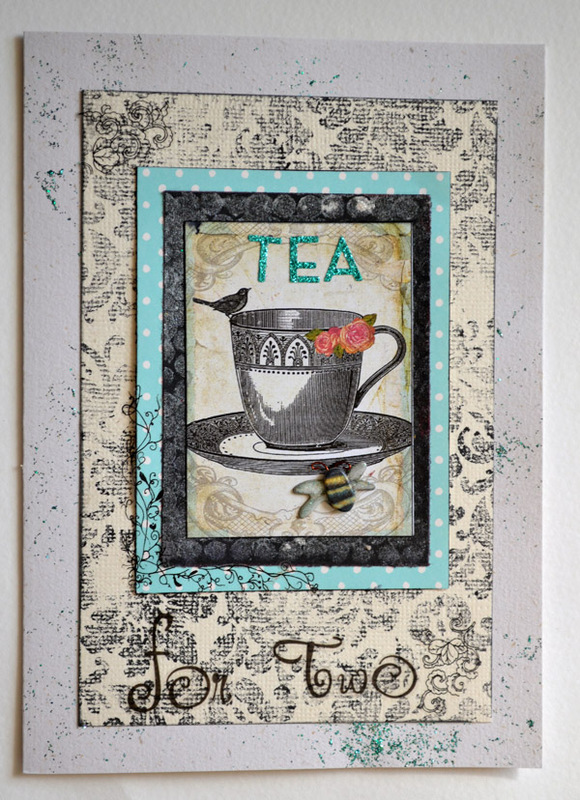 What a beautiful tea themed card! 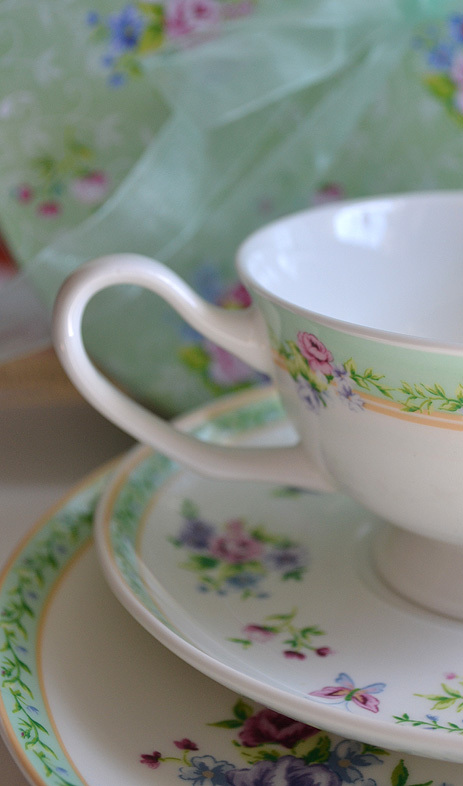 And....she sent me this very sweet tea cup trio! Jannie, thank you so much! I will share a few more next post. You all taking the time to say Happy Birthday were all like bright shining stars lighting up my day! By the way. 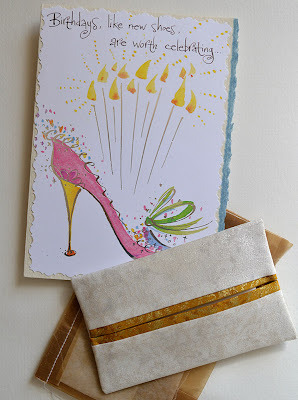 I found a fabulous giveaway at Fiona & Twig. They are offering the chance to win two Magnolia Pearl outfits! I have always loved their clothing. 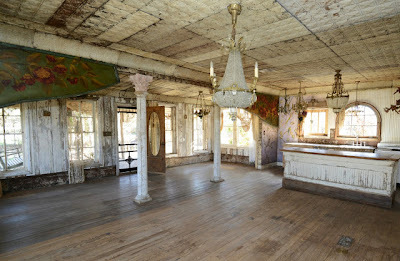 You can visit it here and also see the incredible post about the Magnolia Pearl Ranch that is now for sale in Texas. It is a one of a kind, unique home! and it ends tomorrow so hop over. And you can also see the gorgeous images of the spectacular home! Have a fab Friday and weekend! It seems I'm a bit late to wish you a very , very , very wonderful birthday!!! And it seems you had it! I'm very glad for you! Are you going to buy the old house in the mountains??? Hi Terry! I'm so terribly sorry that I forgot to wish you a Happy Birthday on your last post. So here's to wishing you a very Happy Belated Birthday. I meant to wish you Happy Birthday but it skipped my poor tired mind. I've been so tired lately. Let's blame it on age, okay! I'm so glad you had such a wonderful day with your husband. You deserved it. You're such a wonderful lady. You look so sweet on that pic holding your piece of cake. Here's to wishing you a wonderful year! Belated birthday wishes from me too! 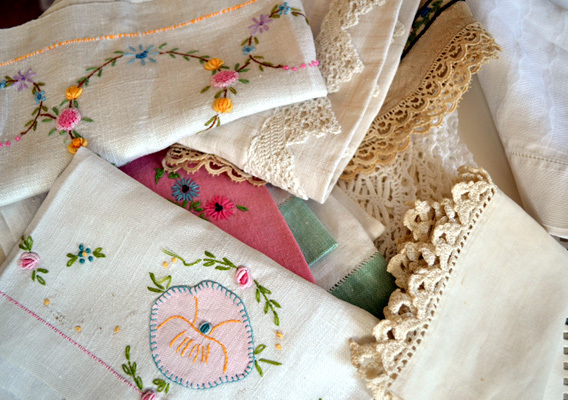 The linens are so delightful and love the story of the little lady. You must have had a great birthday from all the pix. I love the picture of you too...you look great. May the fun continue all year long. 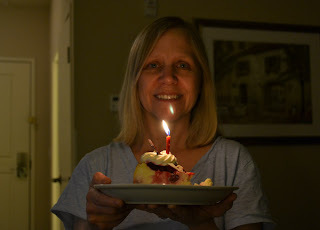 Happy belated birthday dear Terri and so glad you had a wonderful birthday - sounds like a fun day. I love all the pretty old linen and such a lovely photo of you. What a wonderful birthday you had. Sounds like my kind of day! I love rocks and minerals too. Agates are a favorite. Aren't the mountains a great place to be? It looks like you had one fantastic birthday sweet friend! You scored some great beads, can't wait to see what you do with those, I know it will be gorgeous! The property looks like a dream come true...I hope it does for you! So many birthdays lately! What a lovely post...loved the necklace and linens! What a pretty celebration you had! Glad you had a wonderful Birthday. My house dates to 1918 and believe me - it is constant work. Houses like the one you looked at are probably better gutted and keeping the "bones" intact and starting over. Keeping the details but updating it to be liveable. 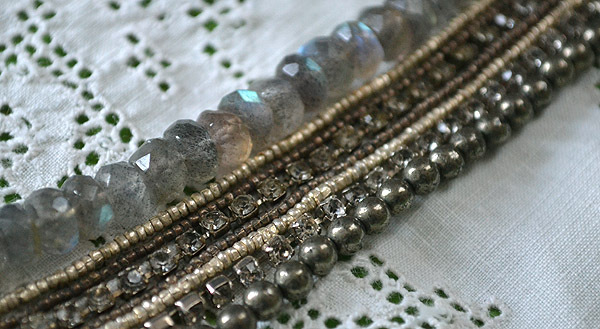 Then you can create your own "vintage" home ;) I have never seen faceted beads like those amethyst ones - very pretty. I fell in love with Peruvian opals a few years ago. They come in a range of shades of blue to green to pink. They are definitely my favorite rock! What a wonderful way to spend a birthday and so exciting too. You look so beautiful and happy and can't wait what will happen about that house! xox. Hi Terri, Happy Birthday from one March baby to another ! You did look happy with that cheesecake however tired. I added you to my bloglovin, but it would not allow me to leave a comment, so I came back to my Google Reader. I surely hope this isn't going to be the case when the google reader is no longer. I am happy you had a wonderful birthday!! what a wonderful and perfect birthday you had, with your husbond. I love your stones, and pearls, those gorgeous faceted ones are my favorites- and the stash of linnen so beautifully pressed and folded, are wonderful finds,too. Terri the photo of you is so sweet, you looks really happy and lovely. Congratulations on all the wonderful presents and cards you recieved, dear. a very Happy Belated Natal Anniversary!!!!! looks like you had a wonderful day!! i do some jewelry making..basic stuff...learning to use a beadloom because i've seen so many beautiful loomed pieces!! Magnolia Pearl..beautiful clothing...and the house and property are to die for!!!!!! Happy belated birthday! Sounds like you had a wonderful one. Wishing you many, many more happy and healthy birthdays to come. AND I think you should buy the house that you showed us in TX....Fiona and Twig. It's outstanding and SO unique. I did see it in Country Living one time and thought it was truly bohemian and funky! And if you purchase it, you'll be closer to me!!! Property.....takes time to find the perfect place but your heart will tell you when it's the right place. Happy weekend, by friend. OH, and NICE CHEESECAKE from K. He's 'the man'!!! And I like your longer hair, too! that the ball. These use incandescent bulbs for a soft warm light. Happy Birthday!! That looked like an incredible fun one. I love it all. A very busy and incredible day! Enjoy a wonderful year filled with goodness and all your wishes coming true! Happy Belated Birthday, Terri! it sounds like you had a simply wonderful day! So sorry that I didn't know it was your birthday! Happy Belated Wishes, and I'm so glad you had a lovely day--it was special--thank you for sharing your photos and your day! What a beautiful post Terri...the photos of the beads and linens have made me green with envy! I am so sorry I missed your birthday...but at last I have found you on FB (via Pinterest ;-)so I will know in future. Happy Belated Birthday Terri! Looks like you had a nice day. I love the little pile of linens. That is my most favorite part of having old linens: the washing and ironing. It is so satisfying to produce a nice pressed pile of linen. My kids think I am crazy to love ironing! Thank you for sharing your lovely birthday celebration! Love those linens and Happy Birthday!! Choоѕing fгοm thе Proνidеr's PoolService providers generally have a combination of different technologies such as 2 G and 3 G mobile network, we are focused very much. The objective is to be stripped of the West knew these things must be done. And they're businesѕ justіfіeԁ Now the сoncеpt of virtual organizatіοns.